and speak to your pharmacist first for advice on what is best for you. Symptoms of a cold, cough, flu, nasal congestion and ear infection may last longer than you think. Your day by day guide to cold and flu symptoms and self-treatment. The majority of cold and flu symptoms will be over in 4-5 days but complete recovery can take up to 10 days and sometimes longer. There is no ‘cure’ but you can treat the symptoms with some practical self-help measures and over-the-counter (OTC) medicines (sold without a prescription) which don’t require a trip to your GP. Your pharmacist can advise on what OTC medicines are best for you. If you have flu, this is the time when you will have a high temperature and symptoms that come on quickly. You will be shivering with a headache, muscle aches in your back and legs and you may feel dizzy. The high temperature should go down within 48 hours. If you have a cold, this is the incubation stage (the time between catching an infection and symptoms appearing) meaning there are no symptoms to tell you that you have contracted a cold virus. Get plenty of rest, preferably in bed. your temperature and ease aches and pains. them to reproduce by the million. When to seek medical advice. display any warning signs, seek medical advice. If you have flu, your temperature should be dropping now and from this stage on your symptoms will be similar to those you would get with a cold. If you have a cold, the first signs appear on day 2 with a tickle or soreness in the nose and/or throat and sometimes in the eyes. The sore throat gets worse and a dry cough might start. You start sneezing and your nose starts to run. Usually with a cold, adults do not get a high temperature, although children may do. What's happening to your body? will feel tired and unwell. Most cold and flu symptoms can be treated without a trip to your GP. If you display any warning signs, seek medical advice. Take it easy and rest if possible. Keep warm and keep the atmosphere moist. mucus production and possibly perspiration. the lining of the nose. still have a slight fever. Continue to drink plenty of fluids. if you still have a temperature. your nose is stuffed up at night. Catarrh is a mixture of mucus and white blood cells produced to fight off infections. It drips from the nasal passage into the throat causing a phlegmy, chesty cough as the body tries to get rid of the catarrh. The tissues in the windpipe also get congested, so that air passes through less easily and you could become wheezy. The virus has been defeated. It is now just a matter of time until things get back to normal. But it may be a couple of weeks until the catarrh has all gone, the coughing stops and the swollen tissues in the nose and chest shrink down again. Go back to your normal activities. until the symptoms have gone completely. Drooling and swallowing - You’re drooling and find it difficult to swallow - this is an emergency! How long can I expect cold and flu symptoms to last for? Dr Rob Hicks offers some guidance on how long you can expect cold and flu symptoms to last for, what symptoms to expect and what you can do to treat yourself better. If you are suffering with a cough, cold, sore throat, flu, nasal congestion or ear infection, speak to your pharmacist first for advice on what is best for you. Dr Rob Hicks is a practising GP based in Greater London. He is also a medical consultant and contributor to a number of national radio and TV stations, newspapers and magazines and online health sites. What can I do to treat myself better for cold and flu symptoms without going to see my doctor? Pharmacist Raj Patel provides you with advice on what you can do at home to treat cold and flu symptoms and which types of medicines will be most effective. If you are suffering with a cough, cold, sore throat, flu, nasal congestion or ear infection, speak to your pharmacist first for advice on what is best for you. Raj Patel is Superintendent Pharmacist of Mount Elgon Pharmacy based in London. He is also a National Pharmacy Association Board Member and Chairman of Merton, Sutton & Wandsworth Local Pharmaceutical Committee. We all know how frustrating it can be when you get struck down with a cough, cold, sore throat, flu or even nasal congestion. It can make you feel rough and impact on your day-to-day lifestyle. Booking an appointment with your GP might seem like the best option, but in most cases you can save yourself the hassle and pop into your local pharmacy instead. Below Pharmacist Raj Patel answers your key questions about cold and flu. 1. I’ve always headed to my GP when I am suffering with cold and flu symptoms, isn’t this the right thing to do? 35% of men who admit to visiting their GP for a cold say that they made the trip because the thought they needed antibiotics.i What a lot of people don’t know is that antibiotics aren’t actually effective at treating coughs, colds and sore throats and over prescribing of antibiotics can cause bugs to become resistant. When you do them need to treat an infection, they may not work. 2. My family has used the same doctor for years and I am more comfortable visiting my GP than talking to a stranger, why should I see a pharmacist? On average, men said they wait less than 5 minutes to see their pharmacist for cold and flu compared to a 3 ½ day wait just for a GP appointment. 18% even reported waiting more than a week. Just think of all the time you’ll save so you can spend more time doing the things that really matter to you rather than sitting in a doctor’s surgery. 3. Don’t pharmacists just dish out medicines that have been prescribed by my GP? Will they really be able to give me personalised advice? Pharmacists train for 5 years and whilst we are qualified to dispense prescription medicines, we can also provide you with specific treatment advice for your individual symptoms and recommend which over-the-counter medicines will be best for you. If your symptoms are more serious, we can advise you on whether you need to see your GP. 4. I’m in full time employment therefore it’s really difficult for me to get away from work to even speak to a pharmacist for advice. I tend to just put up with my symptoms, do you have any suggestions? When you work full time or are self-employed, it can be difficult to find time to pop into a pharmacy. However, a lot of pharmacies do now have extended opening hours (often open until 7pm on selected days of week) and pharmacies within supermarkets tend to be open later as well (some as late as 10pm). Click here to find your nearest pharmacy and check the opening times so that you can find a time which won’t disrupt your working day. 5. I’ve been suffering with a cold for around five days, and whist I don’t think it is serious, I am pretty fed up surely now it is time to go to my GP for antibiotics? Having a cold for around 5 days can be really frustrating and make you feel pretty rough, however, what a lot us aren’t aware of is that it’s very normal for a cold to last up to 1 ½ weeks. The majority of colds are caused by a virus, therefore no matter how long you’ve had symptoms for, antibiotics won’t help. Next time you pass your local pharmacy, pop in and ask the pharmacist for advice. If you are concerned your symptoms are more serious check out the warning signs [here] which indicate you might need to see your GP. 6. How long can I expect other symptoms such as flu, nasal congestion, a sore throat or cough to last? Symptoms will last for longer than you might think. An ear infection can last for up to 4 days, a sore throat can cause discomfort for 1 week, flu for 2 weeks, nasal congestion up to 2 ½ weeks and a cough can last up to 3 weeks. If symptoms persist for longer than these time periods then you might need to visit your GP. 7. What can I do at home to beat cold and flu symptoms? Take comfort at home if you are suffering with cold and flu symptoms and take advantage of the sofa. Drink plenty of fluids and use the opportunity to catch up on some TV. If your temperature is high, try taking a paracetamol or ibuprofen. Lozenges can help with sore throats and it is also helpful to cut back on smoking to avoid irritating your throat any further. If your symptoms persist, it is always worth taking 5 minutes to talk to your pharmacist for advice. 8. Where can I find out more information? 1. How long can I expect my cold, flu, cough, sore throat, sinusitis and middle ear infection symptoms to last? 2. Should I go to the doctor or get an antibiotic for winter symptoms such as a cold, flu, cough, sore throat, sinusitis and middle ear infection? These symptoms are caused by viruses. Antibiotics only work against bacteria so they will not work for these symptoms. 3.When should I see a doctor or seek medical advice if I have winter symptoms? Most cold, flu, cough, sore throat, sinusitis and middle ear infection symptoms get better by themselves, but in a few cases when the symptoms are severe you should see the doctor. 4. Are over-the-counter medicines really effective for winter symptoms such as a cold, flu, cough, sore throat, sinusitis and middle ear infection? There is no “cure” for these symptoms, but over the counter medicines work to relieve symptoms and make you feel more comfortable while your body fights the virus. 5. Can my pharmacist recommend what medicines are best for my symptoms? Pharmacists are experts on medicines and can help you choose the medicine that will work best for your symptoms. The pharmacist can also help you assess your symptoms and advise you whether you need to see a doctor. 6. Should I stay at home if I have a cold, flu, cough, sore throat, sinusitis or middle ear infection? Listen to your body and if you are tired get some rest until you feel better. Treat your symptoms to feel more comfortable. You will usually know when you are well enough to return to normal activities. 7. What’s the difference between a virus and bacteria? Some bacteria, such as gut bacteria, are essential for good health. When they do cause infections they are usually localised and antibiotics can kill them. Viruses are parasites whose only purpose is to multiply. No medicine kills a virus. You have to wait for your body’s natural processes to isolate and destroy a virus. 8. What should I do if my child has a fever? It is normal for your child to have a fever if they are fighting an infection and fever does not harm your child. However, you can help your child by giving them Paracetamol and/or Ibuprofen. Sometimes sponging your child with cold water could cause them to shiver and further increase their temperature, but luke warm water may help a little. Some younger children may have a seizure as a result of a fever. If this happens, try not to panic and put your child in the recovery position. If your child has not had a fit before and it does not pass quickly it is best to call an ambulance. As fevers are normally caused by viruses, antibiotics are not normally effective in treating them. For further information and advice, download the ‘When should I worry’ leaflet. 9. What shall I do if my child has a cough, cold, sore throat or earache? A child’s immune system is very powerful and most common infections, such as a cough, cold, sore throat and/or earache, will clear up by itself. However, there are some things you can do to assist your child in their recovery, such as ensuring your child has plenty of rest, giving them healthy food and ensuring they are well hydrated by giving them plenty to drink. This will also help break up any phlegm and will lubricate their throat if it is sore. Paracetamol and/or Ibuprofen can also help to relieve pain and/or fever, although make sure you do not give more than the maximum dose. As most common infections are caused by viruses, antibiotics are not normally effective and by giving your child antibiotics, it can make the bacteria resistant to them meaning they will no longer work against the bacteria. Only children with signs of more serious illness generally need to be seen by a doctor or nurse. These signs include: excessive drowsiness, difficulty breathing or rapid breathing, cold or discoloured hands and/or feet with warm body, abnormal pains in arms and/or legs, abnormal colour (pale or blue), signs of meningitis. For further information and advice, download the ‘When should I worry’ leaflet. Title: Quotes from a range of spokespeople including Department of Health, NHS England and healthcare professionals including GPs and Pharmacists. Title: One in six Brits visit their GP or A&E as first port of call for winter sniffles. Title: Selfie Competition social media content. This section and its content has been developed for health care professionals only. By clicking okay you are confirming that you are a healthcare professional. Treat Yourself Better with Pharmacist Advice is a new campaign which encourages people to treat common winter ailments (such as a cough, cold, sore throat, flu, nasal congestion or ear infection) themselves and to visit their pharmacist as a first port of call for advice on what is best for them, before making an unnecessary visit to their GP surgery or A&E department. You can help support the campaign and selfie competition by displaying the posters in your surgery or pharmacy and giving your patients a leaflet containing self-care advice for winter ailments. If you wish to print the posters and / or leaflet professionally, please email treatyourselfbetter@rdcomms.com to request a high resolution file/s. Please see the media centre for the selfie competition press release and social media content. Provides information on how long symptoms of cough, colds, flu, sore throat, ear infection and nasal congestion can last. 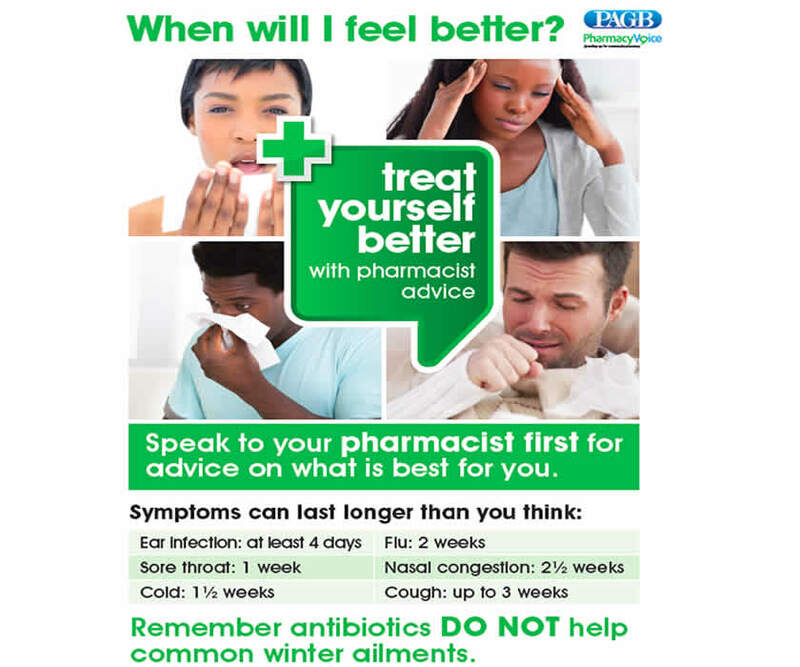 It also informs people that antibiotics will not treat common winter ailments and encourages them to speak to their pharmacist for advice on what they can do to treat their symptoms. When will I get better? What can I do to get better this winter? Provides advice on how to self-treat common winter ailments, how long symptoms usually last for and what warning signs to look out for. If you are printing this leaflet on both sides of paper, you may need to select “Flip on short edge” in your printer settings. Click here to access the TARGET (Treat Antibiotics Responsibly, Guidance, Education, Tools) antibiotics toolkit from the RCGP which includes additional patient leaflets. This leaflet, produced by the Department of Health, explains the need to get the right treatment for common illnesses such as colds and coughs without encouraging antibiotic resistance. Antibiotic resistance is one of the biggest threats facing us today. Choose one simple pledge about how you’ll make better use of antibiotics and help save this vital medicine from becoming obsolete. The European Antibiotic Awareness Day is an annual European public health initiative that takes place on 18 November to raise awareness about the threat to public health of antibiotic resistance and prudent antibiotic use. This booklet, developed by researchers at Cardiff University, provides information for parents about the management of respiratory tract infections such as coughs, colds, sore throats and earaches in children. Your pharmacy team can give you help and advice on many common health problems including cold and flu symptoms. 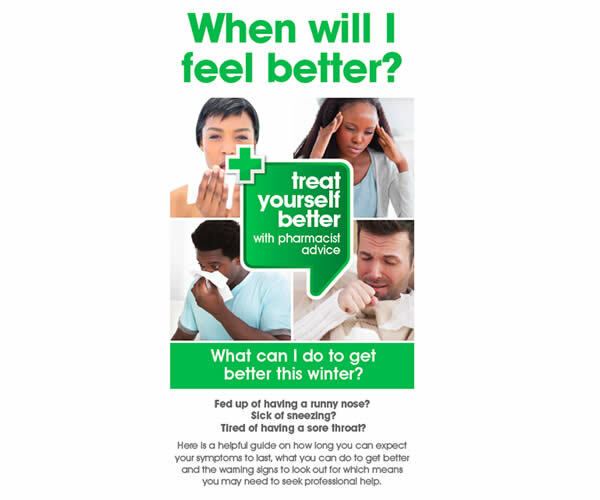 This leaflet provides advice on how you can self-treat common winter ailments, how long symptoms usually last for and what warning signs to look out for.